BANGI, 22 September 2014 – If all goes well, Malaysia may have its first nuclear reactor producing clean and renewable energy by the year 2025. 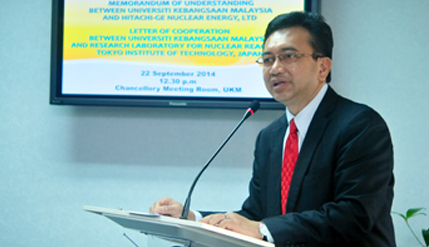 The National University of Malaysia (UKM) today signed a memorandum of understanding (MoU) with Hitachi-GE Nuclear Energy Limited and a letter of cooperation (LoC) with Tokyo Institute of Technology’s Research Laboratory for Nuclear Reactors here in a move towards making nuclear power generation a reality in ten years time. Both documents were signed by Deputy Vice-Chancellor (Research and Innovation) Prof Datuk Dr Mazlin Mokhtar for UKM while Akira Maru, Senior Corporation Officer, Hitachi-GE Nuclear Energy and Prof Dr Masayuki Igashira of Tokyo Institute of Technology represented their respective organisations. Science and Technology Faculty (FSR) Dean Prof Dr Sahrim Haji Ahmad witnessed both signings for UKM. Prof Mazlin said despite the sensitivity over nuclear power there is no doubt that the advantages for nuclear energy far outweighs the risks as proven in many developed countries. He said although the Fukushima earthquake and tsunami in Japan in 2011 had seriously damaged the Fukushima Daiichi nuclear reactor and threatened the public, there are many other plants around the world that remain safe and stable. “Nothing is completely risk-free. There are great benefits if we use nuclear energy carefully for sustainable and renewable energy while putting in place security measures,” he said. He acknowledged that the Fukushima Daiichi nuclear disaster had increased fear among many Malaysians over the risks of radioactive exposure. There is thus a need for academics and researchers to take measures to explain to the public that it would be in their interest to adopt nuclear power. Prof Mazlin said researchers in the social sciences and humanities should also look into the attitudes of the people if nuclear power is introduced. The LoC and MoU, provide for 18 UKM students in nuclear science to spend about a week in Japan to observe the technology being used there. Also present at the signings were Prof Dr Rusli Daik, Deputy Dean FST (Research and Innovation) and the country’s nuclear pioneer Prof Emeritus Noramly Muslim of UKM. Prof Mazlin paid tribute to Prof Noramly for the latter’s hard work and forward thinking in keeping Malaysia on track for nuclear readiness.